When it comes to sublime storytelling there are few that can match master auteur and eternal outsider Nicolas Roeg for vision, originality or technical knowledge. I am a huge fan of his work, always original, always more about art surreally reflecting; nuances of story, broader life, social context, creating mood and mind states, than a linear story arc, always surprising and always drawing out incredible performances from his cast for his films. 27 August - The official, definitive making of The Man Who Fell To Earth book is available for preorder! 9 September: Nicolas Roeg's The Man Who Fell To Earth will be launched into UK cinemas! 9 September: Hackney Picturehouse Special Event - The Man Who Fell To Earth with introduction from Danny Boyle and after party! 9 September & 28th October: The Original Soundtrack for The Man Who Fell To Earth will be available on CD & vinyl for the first time! 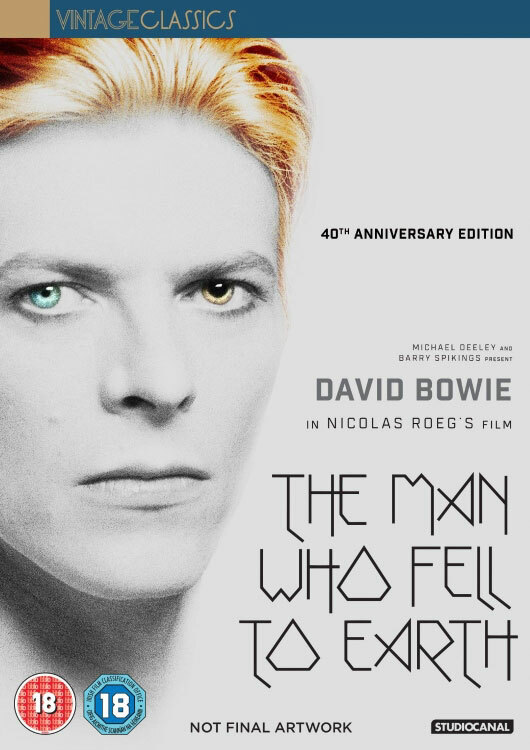 24 October: The Man Who Fell To Earth Home Release is launched! 25 October: David Bowie's The Man Who Fell To Earth play - Lazarus starring Michael C. Hall lands in London! Roeg's films have made an indelible impact on me and to be quite honest I have always wondered why the man is not more celebrated for his contribution to the art of cinema. In all fairness I would be amiss if I did not mention that David Lynch, Nicolas Winding Refn and to some extent, as he is much more subtle - Ben Wheatley are making a damn good attempt at walking a similar path. Roeg's "talent as an auteur is immeasurable, to this day his oeuvre of films are just as impactful, engaging and influential as they were on release. I have a particular obsession with his debut feature film (as co-director) Performance starring James Fox, Mick Jagger and Anita Pallenberg. I doubt there will ever be a similar type of film that could possibly come close to Performance, as with his stranded alien on Earth tale - The Man Who Fell to Earth starring David Bowie, in his first big screen role, his grief filled horror Don't Look Now starring Julie Christie and Donald Sutherland and of course the timeless tale of love, desire and lust Bad Timing starring Art Garfunkel, Theresa Russell & Harvey Keitel. The Man Who Fell to Earth is a 1976 British science fiction drama film directed by Nicolas Roeg and written by Paul Mayersberg, based on Walter Tevis' 1963 novel of the same name, about an extraterrestrial who crash lands on Earth seeking a way to ship water to his planet, which is suffering from a severe drought. And indeed some of his works are amongst my favourite films, but all of them across the board, are compelling viewing and offer an almost hallucinatory and unique viewing experience. Roeg's works have been on my mind lately, most recently with the release of concept art for the Blade Runner sequel, the original was made by legendary British Producer Michael Deeley who also produced Nicolas Roeg's brilliant adaptation of Author Walter Tevis' The Man Who Fell to Earth, watching the extra features on last year's Far From The Madding Crowd restored release I discovered Nicolas Roeg's involvement and early signs of his trademark camera work, and of course with the tragic passing of one of our shining lights - David Bowie the titular Man Who Fell to Earth - one of my favourite science fiction films of all time. 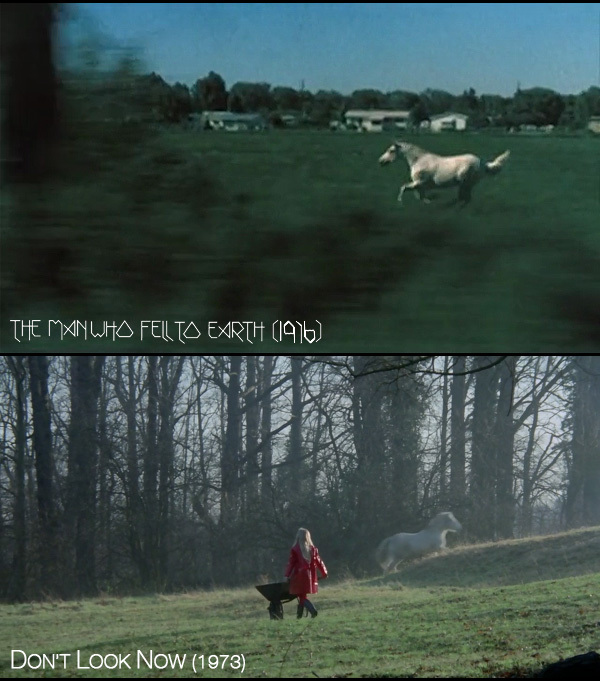 For me The Man Who Fell to Earth is a companion piece alongside Roeg's debut feature six years earlier - the great Performance, which he shot and co directed with Donald Cammell (a character in his own right who conceived the concept, wrote the screenplay and invited Roeg along) and his darkly tragic Bad Timing with Art Garfunkel. Not only do the film and music world's blur with the casting of prominent musicians - Mick Jagger in Performance, David Bowie in The Man Who Fell To Earth and Art Garfunkel in Bad Timing but reality and film merge as Roeg explores issues of identity, loss, duality, grief, isolation and humanity in an experimental experience - drawing on his actor's understanding of the issues of fame and the lines between themselves and others to bring their characters to life in engaging performances." The list goes on and on and includes: Gene Hackman, Theresa Russell, Rutger Hauer (and early appearances from Mickey Rourke & Joe Pesci) in Eureka, Gary Busey, Tony Curtis & Theresa Russell in Insignificance, Oliver Reed & Amanda Donohoe in Castaway, Theresa Russell, Gary Oldman & Christopher Lloyd in Track 29 and Tim Roth & John Malkovich in Heart of Darkness, etc. I'm not ignoring his most recent works - I have chosen to stagger their viewing as I now can still look forward to that pleasure. Nic Roeg is one of Britain's most important and inventive directors. His films range from the antipodean eeriness of Walkabout, the timeless chills of Don't look now, through the science fiction of The Man Who Fell to Earth, the dark erotisicm of bad Timing and most recently the strange magic of Puffball. But whatever story he is telling his preoccupations remain the same: the reflective surfaces of reality, the importance of sound and music and the non linearity of time itself. 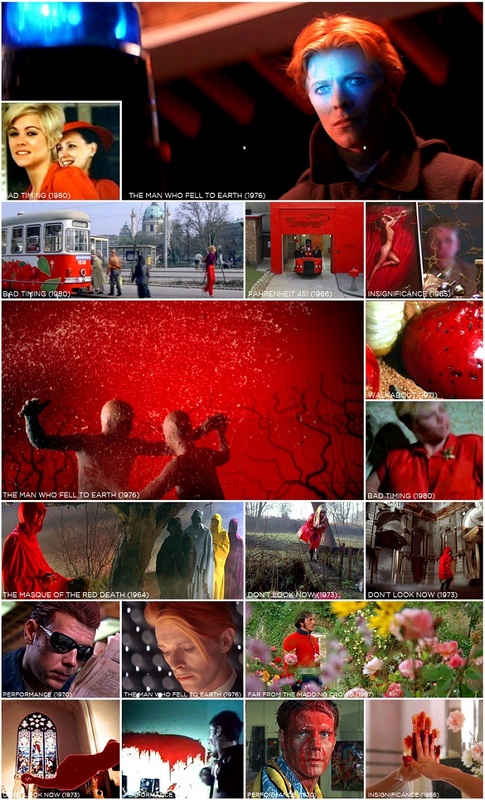 I would also like to add that Roeg's work is almost instantly recognisable by his bold use of colours, particularly splashes of red, as well as his use of zoom, both distinct hallmarks that he developed whilst a cinematographer. To make the most of the video mashup below about the themes in Nicolas Roeg's work - push play on both videos, make sure the volume is up on the 1st video Mark Cousins introducing Nicolas Roeg's Bad Timing for Moviedrome but mute the sound on Mashup Artist Hugo Red Rose's Five Themes For Nicolas Roeg video, st back and watch. 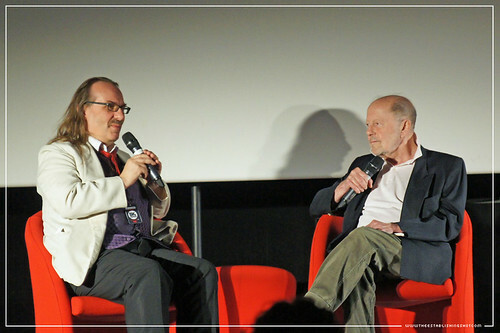 As a young man, Roeg saw a film being dubbed into French and loved the way the action would go forward and back forward and back until the actor got the timing right. He says that this made him think of cinema as a kind of time machine and it seems to have drawn his attention to the pleasures of fragmented bits of action, of moments intensified by repetition. So I'm rather chuffed that Nicolas Roeg is getting some attention of late, culminating in a large push around the 40th anniversary restored re-release of Roeg's brilliant 1976 The Man Who Fell to Earth starring David Bowie. Granted this probably has more to do with the passing of a cultural icon but if it brings The Man Who Fell to Earth and Nicolas Roeg back into the foreground I'd say it's about time. People of my age are the first, or rather, the second generation of realising what the cinema is. I have already posted about the The Man Who Fell to Earth 4K restored home re-release but along with this alert came confirmation of some of the actual extras available on the Home Release. Which are below. 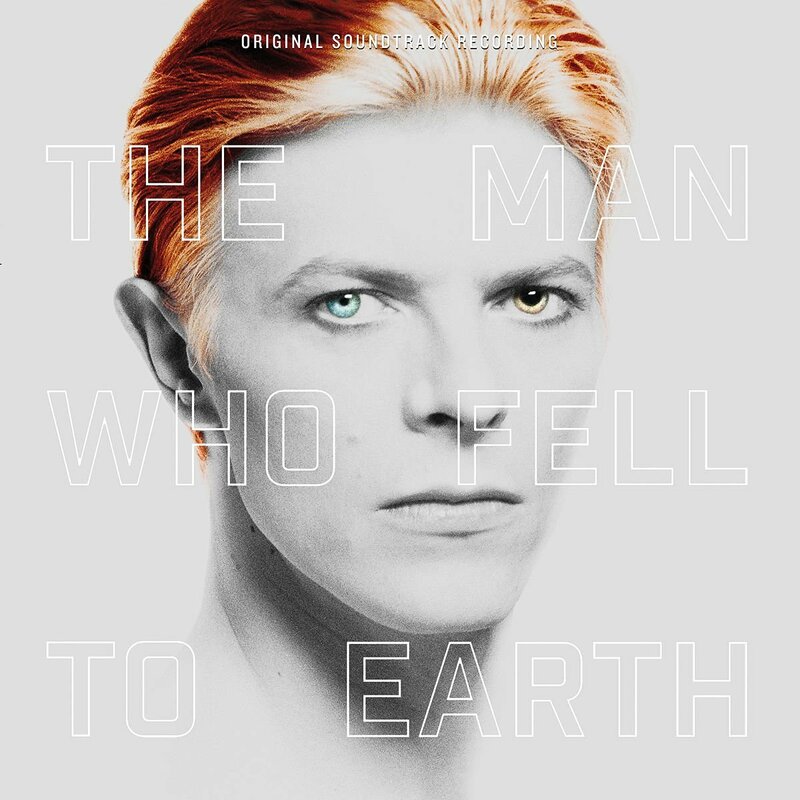 A new book about the making of The Man Who Fell To Earth, is also being published to mark the 40th anniversary of the film’s release. Written by Jay Glennie and Darryl Webber, over 300 pages it gives a fascinating insight into how this landmark film was put together through new interviews with cast, crew and others involved in the production. The film will be released in cinemas nationwide on 9th September by Park Circus. 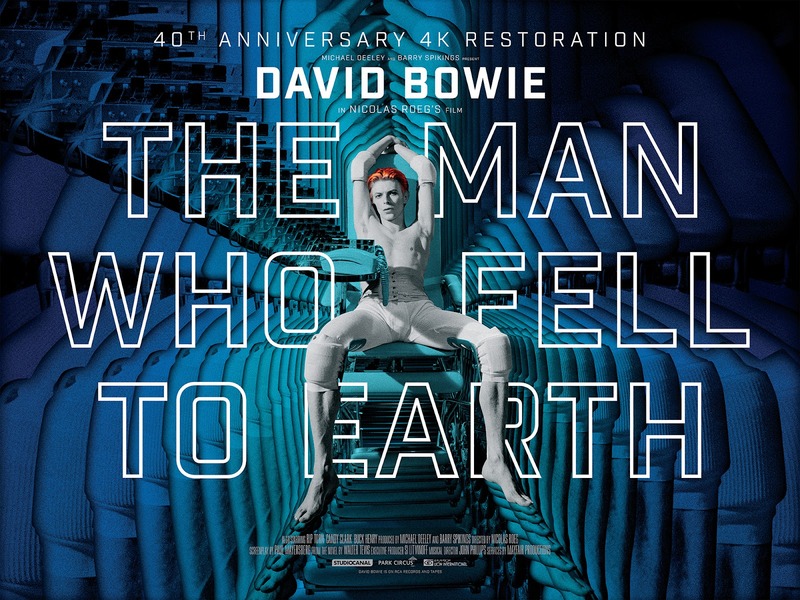 Restored by Deluxe London, the restoration of The Man Who Fell to Earth is based on a 4K scan of the original camera negative, followed by a full 4K workflow, with the approval of Nic Roeg and the assistance of cinematographer Anthony Richmond ASC, BSC who was closely involved in the new grade. I had been disappointed with previous editions of the film for which I hadn’t been involved in the grading process. The colourist Steve Bearman and I have brought the new 4k restoration in line with the original film print. I felt that certain scenes were lacking that look and feel. Probably the biggest change is early in the film where David Bowie is sitting by the riverbank drinking water and looking at the rings. We warmed it up and made it match the print. Featuring a startling and era defining lead performance from David Bowie (The Prestige, Labyrinth) in his debut feature role and based on the cult novel by Walter Tevis, The Man Who Fell to Earth endures as, not only a bitingly caustic indictment of the modern world but, also, a poignant commentary on the loneliness of the outsider. Meanwhile, over in Hackney on Friday 9th, Oscar-winning Director Danny Boyle introduces a special screening at Hackney Picturehouse. This is one of his favourite films and he has often sited Nicolas Roeg as a key influence on his career (he referred to the film in the London Olympic opening ceremony). One of Nicolas Roeg’s most elliptical, not to say intractable, films, in which he takes his cross-cutting, kaleidoscopic style to its furthest limits. A simple story by Walter Tevis, about a disorientated alien visitor (Bowie) trying to get back to his own planet, is transformed into a dense extravaganza - part road movie, part corporate thriller, part sci-fi fantasy. Oscar-winning Director Danny Boyle introduces a special screening of the new restoration of The Man Who Fell to Earth, one of his favourite films, on behalf of its director, Nicolas Roeg, whom he has often cited as a key influence on his career. Then dance the night away to Bowie tunes in the Attic Bar, courtesy of a DJ set from Readers Wifes. Curzon Soho are declaring Friday 9th September a one-off David Bowie Day as part of their campaign to save the cinema from demolition. After a special Save Curzon Soho edition of David Bowie Is Walking In Soho tour of the Thin White Duke's locations, led by the V&A’s David Bowie Is curator Geoffrey Marsh, join the team at the cinema for a very special screening of The Man Who Fell to Earth introduced by its costume designer May Routh. The original soundtrack album will soon be released for the first time by UMC. 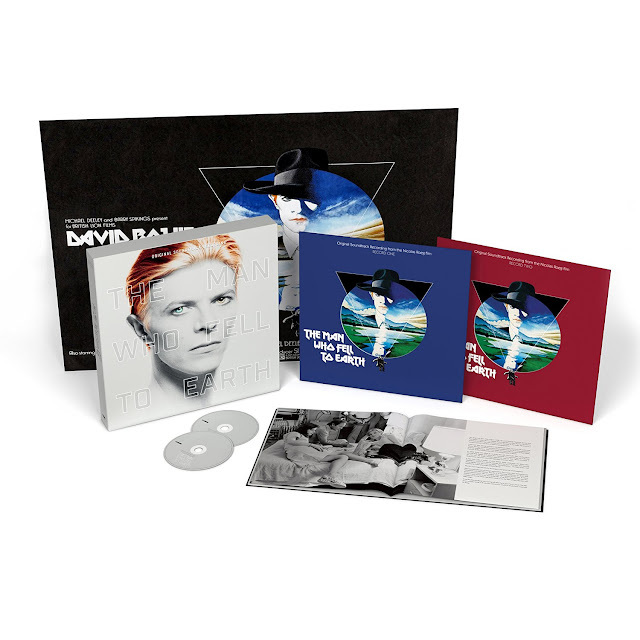 A 2CD set from 9th September and a 2LP and Deluxe 2CD/ 2LP Box Set from 28th October. David Bowie was originally due to record the soundtrack but Nicolas Roeg decided the direction he was going in didn’t fit the film and, so, hired The Mamas & The Papas’ John Phillips instead. Video Essay: The Man Who Fell to Earth from Film Comment on Vimeo. Rumour has it that the tracks Bowie wrote for the film formed the basis of his albums STATION TO STATION and LOW, both recorded in the years after the film’s release and featuring stills from The Man Who Fell to Earth as their covers. The vinyl version contains the Stomu Yamash’ta and John Phillips tracks only. 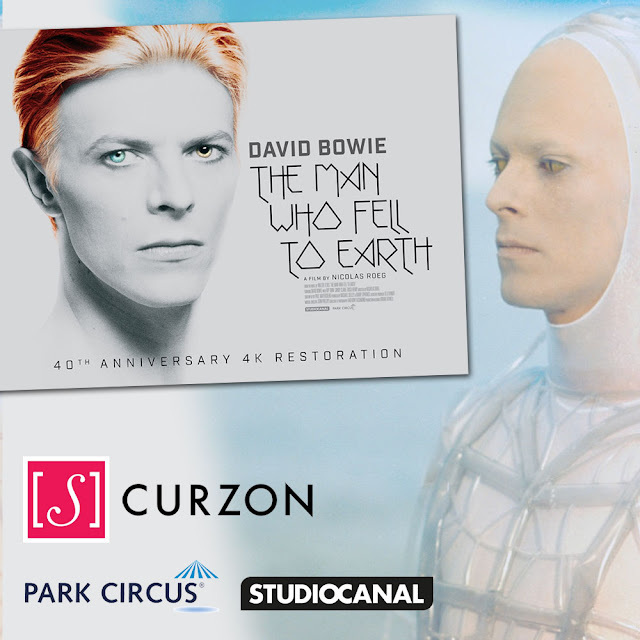 The Man Who Fell To Earth will be available to Download, DVD, Blu-Ray and as a Collector’s Edition from 24th October by STUDIOCANAL, complete with brand new bonus material and special packaging, as part of their Vintage Classics range. Exclusive to the Collector’s Edition will be a bonus John Phillips CD, a booklet with essays on the film and the soundtrack, 4 stunning, collectable art-cards, the press book and an A4 poster of the brand new theatrical artwork. This October will also see the musical Lazarus arrive in London. 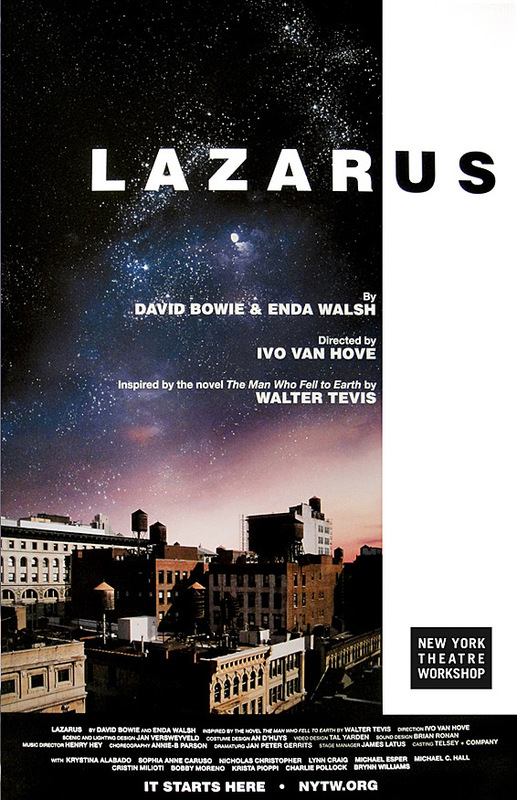 Inspired by Walter Tevis’ book, The Man Who Fell To Earth, Lazarus was written by David Bowie and Enda Walsh, and is directed by Ivo van Hove. Michael C Hall, Michael Esper and Sophia Anne Caruso will reprise their roles from the original New York Theatre Workshop.